Wash and cut the chicken into small cubes.Dry completely with a paper towel. 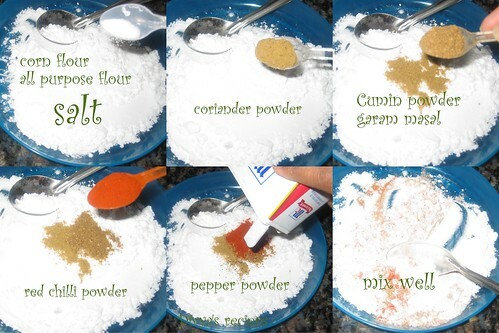 Combine the salt and black pepper . keep it for 30 minutes. 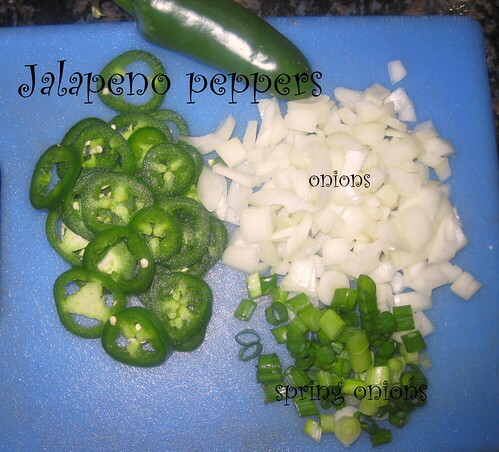 Chop the onions and spring onion.Jalapenos into thin slices .Keep aside. Combine the all purpose flour and cornstarch in a bowl.Add the pepper powder,cumin powder,coriander powder,red chilli powder and salt mix well.In a shallow bowl,beat the egg. keep it aside. 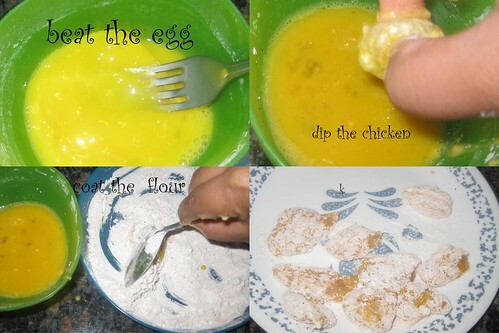 Dip chicken into egg white,then coat in cornflour mixture,shaking off excess flour. 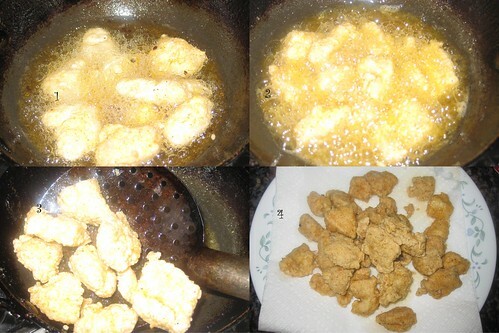 Heat oil in wok ,when oil is hot add the coated chicken pieces fry until golden and crisp,using a slotted spoon,remove and drain on paper towels. 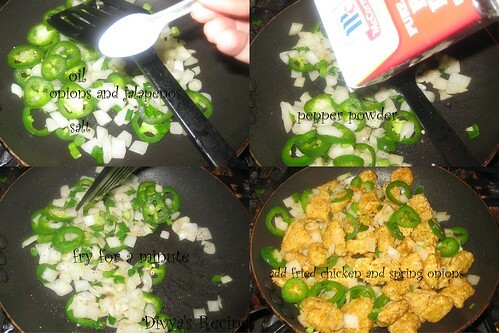 In a separate frying pan, on high heat, add 1 tsp of oil .Add onions and jalapenos,pepper powder and salt stir fry quickly until fragrant,about 1 minutes.Add the spring onions and fried chicken in the pan and toss to coat the chicken with the onions mixture.Remove from heat . Transfer to a plate,garnish with coriander leaves and serve immediately with some steamed rice. Wow mouthwatering chicken. Nice pics. nice recipe and nice shots! Hi Divya, wow... that look delicious and very appetizing. I love your cute presentation. Nice pictures. 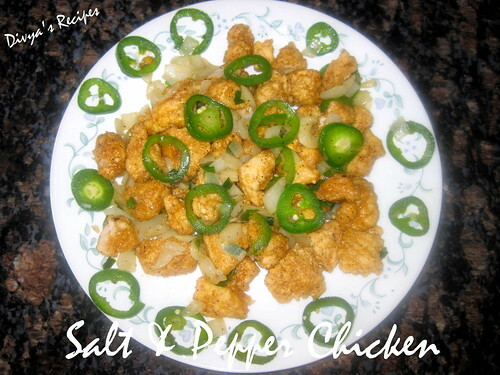 Delicious looking salt and pepper chicken. 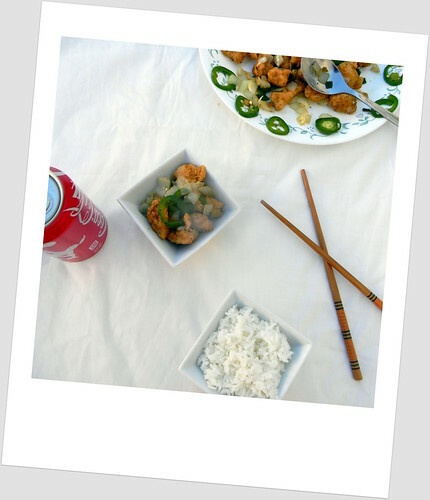 Beautiful clicks and I love this simple recipe. Loved the recipe Divya !!! Looks very tasty!! Wonderful pictures!! Looks inviting and fabulous chicken preparation Divya. Yummy! 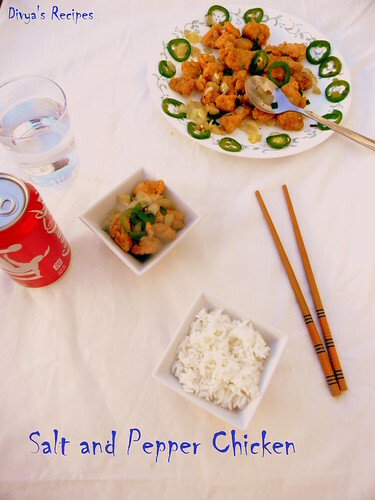 Wow such an irresistible chicken dish, love to have just like a snack, fantastic dish. I love chinese! This one looks yummy! 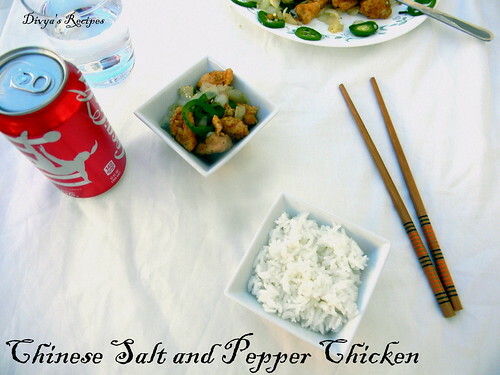 Chinese salt and pepper chicken looks delicious Divya. Nice and crispy chicken. Loved it. Looks fabulous Divya and the spices used must have given a good flavor. Good presentation. 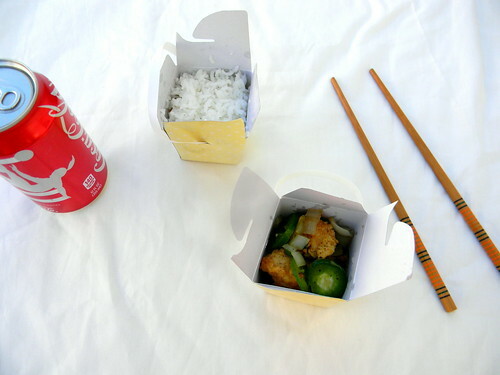 Oh, you can make very Chinese dish , yummy ! 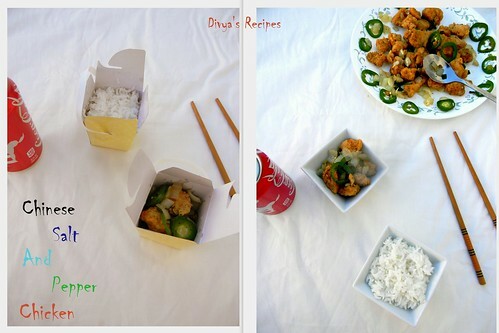 hey Divya, glad that you liked my version of "your" recipe. thanks to you. next, i need to try this one out. :). keep inspiring! very neat presentation and yummy chicken..